The Golden Dawn released lots of Mod Disks and this one is extra incredible because it's a humorous hack of Cannon Fodder showing ST soldiers graffiti the Amiga HQ before it escalates into a mini-war. What a superb idea and one which nicely represents tensions between ST and Amiga users back in the day (has it ended?). Well, this "mod disk" is stuffed full of tunes which supports various addon hardware gizmos. This also includes the DMA audio coprocessor within the Atari STe for stereo playback. Download this right away and enjoy the fantastic intro before listening to these super duper tunes. My thanks to STompy for telling me about this intro! 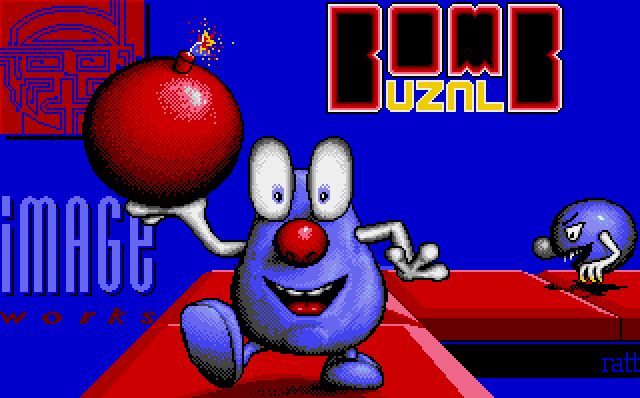 It's time for some more amazing 16-Bit #PixelArt with ImageWorks' 1988 hit Bombuzal. 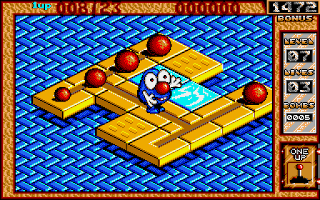 I remember seeing this in the magazines of the day and couldn't believe the cartoon-like quality of the main character within his colourful isometric world. He is an odd potato-shaped dude who performs a funny expression as the bombs are exploding - it's almost like he doesn't trust himself!! There are some big names associated with this game but is it any good? 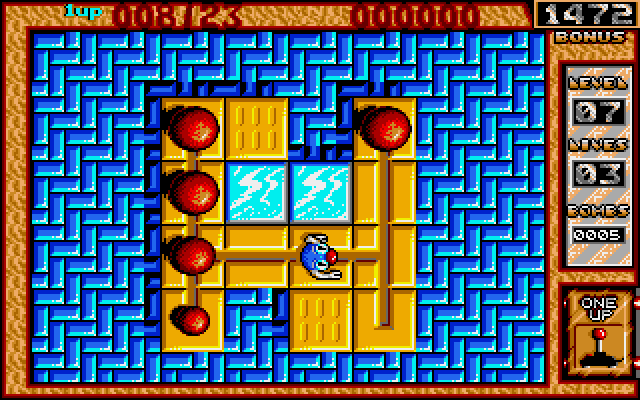 This is actually a pretty simple puzzler which requires us to blow-up each levels collection of big red bombs. The screen contains a number of squares we can use to help calculate our best route through but watch out for a number of traps along the way. Like crumbling tiles which can be walked on only once before they disappear forever, so don't get yourself stranded. 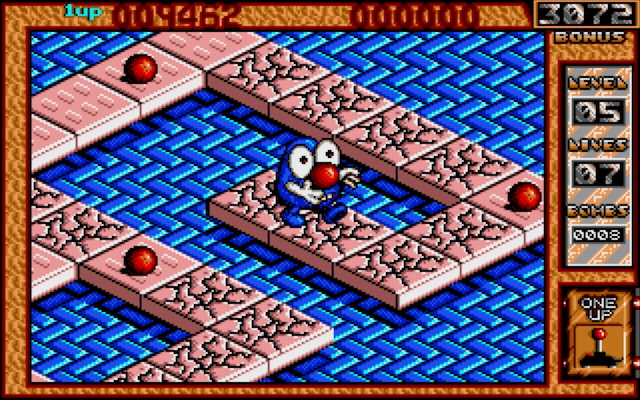 Other tiles might be too slippy to walk on whilst some can transport you to another location. Slotted tiles allow us to move selected bombs to a different location, usually to avoid being caught up in an explosive chain reaction. I like Bombuzal, it's a fun game to tax the old brain cells and it's got fantastic pixel art too! - Hard disk installable versions are available thanks to 8BitChip and Klaz. - I've recorded a video which shows my brain struggling but at least I made a Hi-Score!! Can you beat me? A nasty virus has infected the automated machines on Mars so the robots have captured our scientists and are holding them captive. We have no anti-virus program at hand so it's our job to destroy any robots that get in the way and help lead the boffins to safety. Jump inside your spaceship and get ready to save the day once again! Rebellion is a top-down shoot 'em up similar'ish to any Gauntlet-like game you may have played. 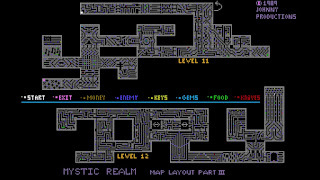 Each screen has a number of trapped hostages which are often located in different areas. Some are behind a forcefield which can be partially deactivated by disabling a section of its wall. You won't have long before a repair droid appears so don't dawdle! Others can be in locked rooms which require a key card a robot may reveal when killed. 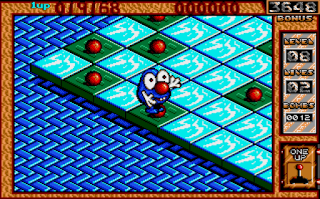 Every level has a minimum number of hostages to rescue within a set time. Miss this and the spaceship will leave without you! 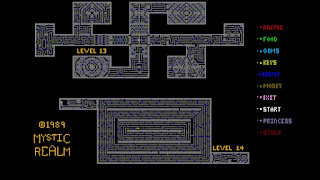 Enemy robots have a range of different abilities: some are slow whereas others are much faster and another can even lay down explosive mines. Some have no projectile weapon but others are only too eager to turn you into a blood splatter! Also, watch out for gun turrets, trapdoors, and large tanks. Interestingly, when you do lose a life, the robots are paused for a few seconds thus giving you some extra time to whack 'em full of lead. Our machine gun can be upgraded with more power and a faster action - just try not to kill any humans in the crossfire! There are a variety of other power-ups to enhance shields, invincibility, a radar scrambler and even a supply extra lives. Things don't sound too great... Sabotage... Mutiny... Rebellion? I wanna go home!! I don't normally enjoy games that have me worrying about the safety of computer-controlled characters whilst being hunted by the foe. I panic too much and everyone usually ends up dead! However, Rebellion works very well even though the hostages are lame at following so will often get stuck behind a wall... I'm never too happy about time limits and this one seems to have a mind of its own and may prove troublesome on later levels? 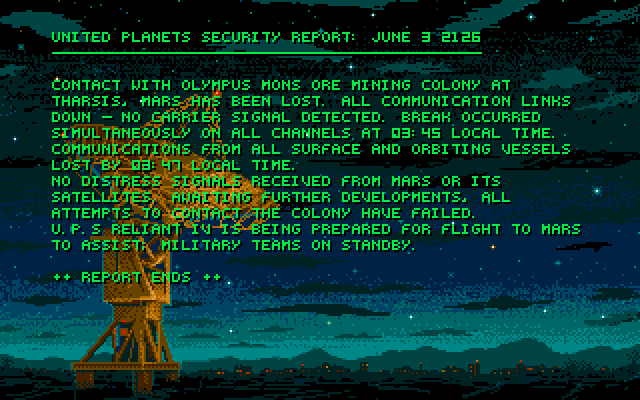 This is an enjoyable shooter and it's anxiously-good fun guiding scientists back to safety. 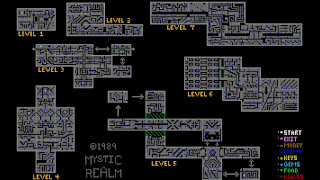 Each level has an intricate and interesting design with gameplay that is progressive and an addictive experience. I love this game. - A hard drive installable version can be downloaded from the D-Bug website. 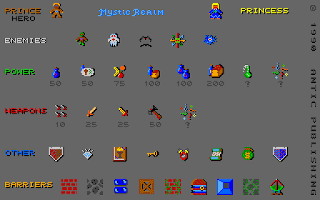 - Floppy disk based games can all be grabbed via Old Games Finder. 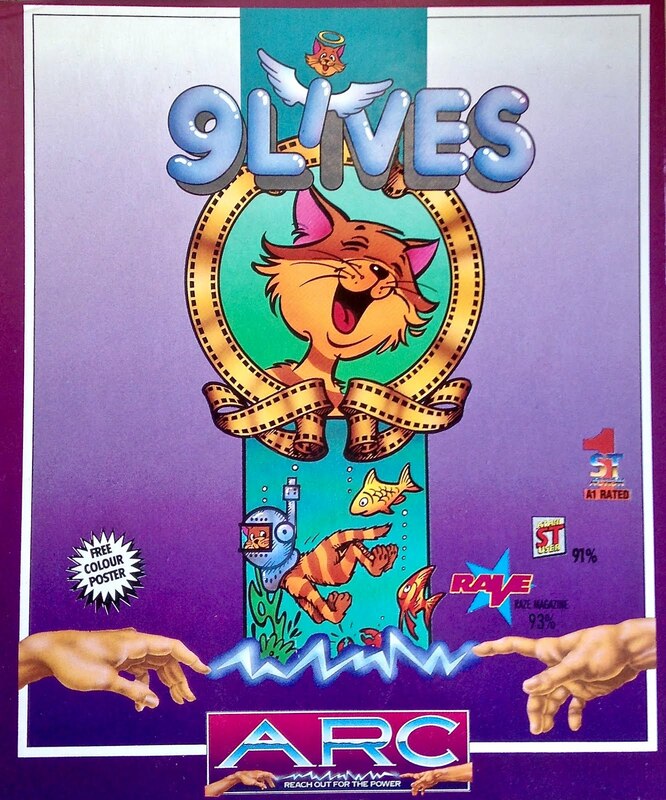 It's time once again for some Atari ST box art and today we have 9 Lives. Like most Arc games, this has a simple box design but is also pretty comical with a laughing cat that reminds me of Tom And Jerry. I must admit, I laughed at the glowing reviews plastered by three popular magazines! This has to be a great purchase, right? 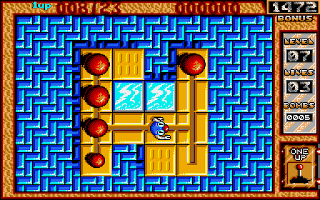 Sadly, they were wrong because 9 Lives is incredibly difficult, bordering on impossible! 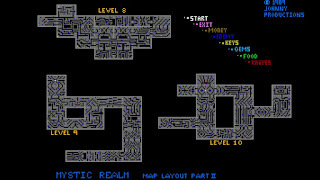 At first, I thought this might be because of the controls, which do take some time to fully master. Once you have, I personally think they are perfect and find it easy jumping up through the platforms and those long leaps are guided by a meter for fine control. Just look at those funny face and I'm sure some characters have been designed by insane people!! What I feel is wrong are the gameplay mechanics which present a number of awkward flaws that irk me. 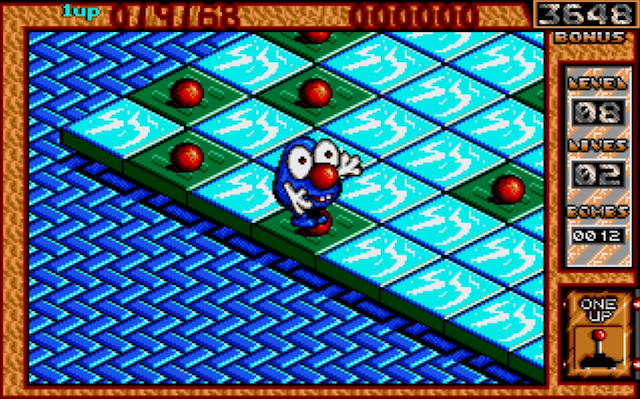 The enemy sprites are far too big so each screen is overly cluttered, thus Bob cannot help but catch something nasty. Sure, I can knock them out with my woolly yo-yo but it's not long before they get up again to zap more of my lifeforce! Also, the level design is incredibly unfair and requires a psychic gamer that previously is aware of every off-screen trap. Argh, those darn spikes!! Oddly, for a cat, Bob cannot fall very far without dying!! However, this does produce a hilarious animation effect not too dissimilar to Wile E. Coyote from the Road Runner cartoons. The animations throughout are absolutely brilliant and I love how Bob struts his stuff walking across my screen. I love it when he clings onto a ledge, just before managing to pull himself up. In fact, the graphics are always superb with every screen highly detailed, beautiful landscapes and characters. 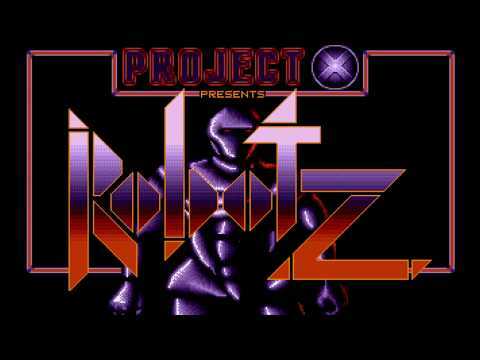 Audio isn't left behind, the most gorgeous YM Chipmusic plays and it's a belter. 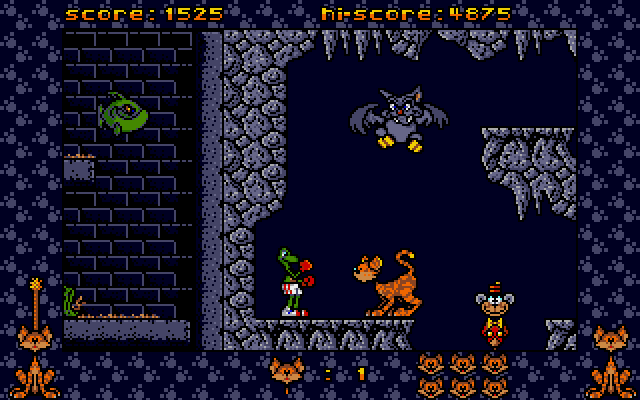 Yep, 9 Lives certainly looks a sounds superb for a gorgeous 16-bit title. Personally, I think 9 Lives had the potential to be a great game but I doubt it was produced (nor tested) by actual gamers so I can imagine most will play this once or twice before giving up. Which is a shame? To think I bought this... but it's still a piece of ST history so I will cherish this game. Just make sure you enable the trainer option!! Go on I dare you to play!! 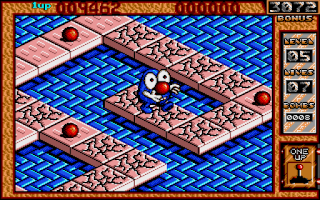 Floppy available via Old Games Finder with a hard drive version by 8BitChip. An evil vagrant has kidnapped the Princess (or Prince if you prefer to switch characters) and now she requires our valiant rescue. Whatever character, we are once again crawling through monster-infested dungeons fighting zombies, ghosts, bats, and more. 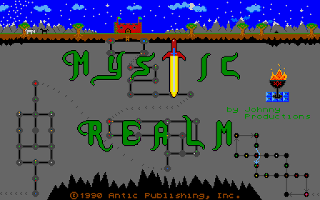 It may look like it was made in 1985 but Mystic Realm was released much later in the ST's life by developer John Lince for STart Magazine in 1990. Impressively he programmed it in GFA Basic! Various weapons can be collected throughout our journey and each translate into a specific number of knives for our adventurer. No other weapons are actually used but collecting a high ticket item like an axe will reward your inventory generously. The firing method will instantly feel familiar to Berzerk fans - hold down the joystick button and tap the direction you wish to throw a knife. It's apt and works superbly well. However, beware not to waste your ammo because you never know how long it will be before you can top-up your arsenal. Health points are displayed top/left of the screen and detail our vitality from 0 (you're dead) to 999 being the maximum. It's hungry work being a heroic gingerbread man so chomp on whatever you find to keep yourself alive. If you are already near the max then it might be worth leaving food behind until later? Sadly, health isn't regenerated at the beginning of a brand new level and you will transform into a skeleton if you foolishly starve to death!! 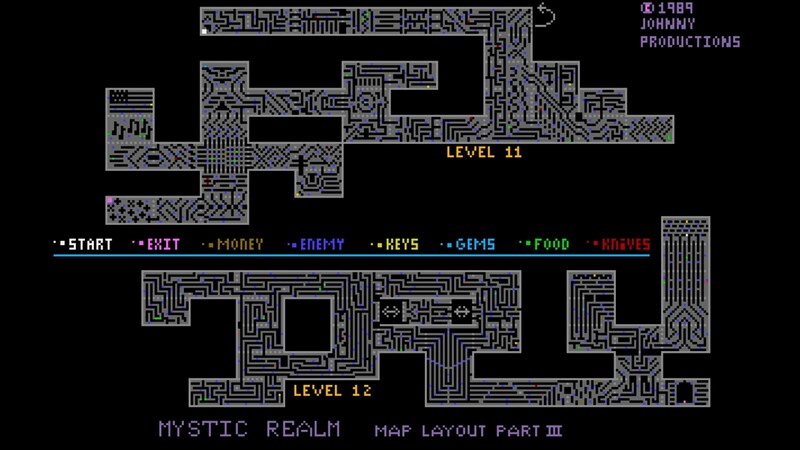 Don't be fooled by the humble graphics, I find Mystic Realm quite fascinating and it reminds me of the games I played as a kid. The little sprites are nicely drawn with comical retro details, I love the wobble of a zombie walk and the ghosts look fantastic. 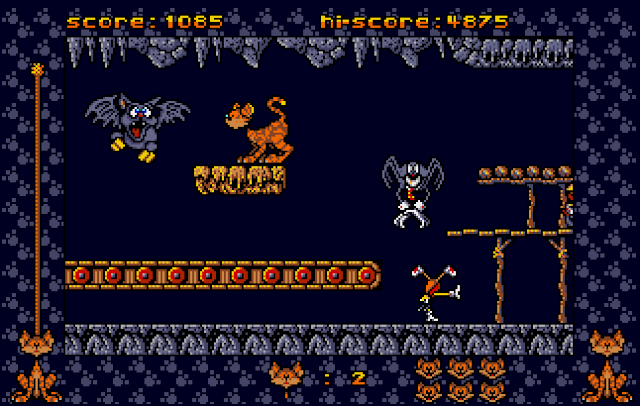 Even the meagre sound effects transport me back to the 80s as I hear the knife skim through the air on its way to hit a fiend. Yes, I'm not ashamed to admit that I adore its authentic 8-Bit atmosphere. 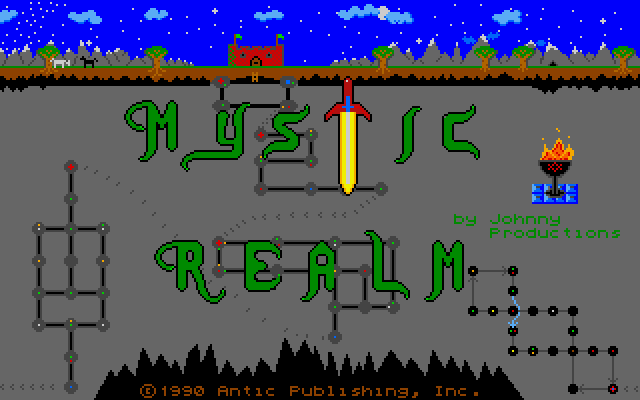 Mystic Realm proves jazzy graphics and sonic boom effects are not required to make a game great and that is exactly what we have here. I've really enjoyed the arduous task of rescuing yet another damsel in distress! Lately, he has posted many videos that show the gorgeous sprites, lush arcade landscapes and smooth scrolling but Sascha has this week released the first download for us all. 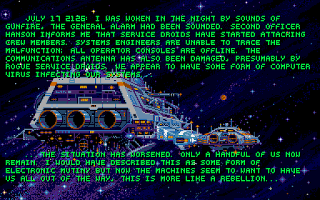 This is one of those jaw-dropping moments and proves just what the Atari STe is capable of producing. An incredible release and one which won't fail to impress! We have extra on-screen colours and the horizon's landscape/clouds make use of the Blitter Chip. The title music is replaced by 5-channel (DMA) YMT tunes which are based on the arcade scores. The in-game music is also to be replaced with 3-channel YMT tunes which I'm excited about. The DMA hardware will be used for all in-game sound effects, again taken from the arcade. The betas I've seen give a fascinating insight into how the final product will be. Even at this early stage, it's better than the original ST conversion (which I love). So, yes, I am very excited about this project!! Watch this space. 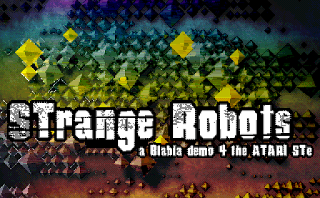 Strange Robots was released in 2013 for Silly Venture by BlaBLa and Mandarin. It's one of those demos I've had on my Ultrasatan since the very beginning and is a personal favourite of mine. I love the presentation styles that also display an incredible range of colours with a funky 505 tune enjoyed throughout. What's not to love? 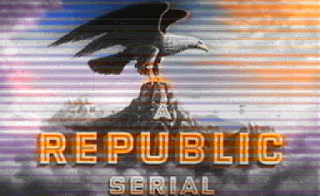 Demozoo has the download which will require an Atari STe with a jaw-dropping 4MB Ram. If you like this, then I suggest you take a look at Circus back²STage, JAPAN beauties and troubles and STreet Art - all excellent demos!! 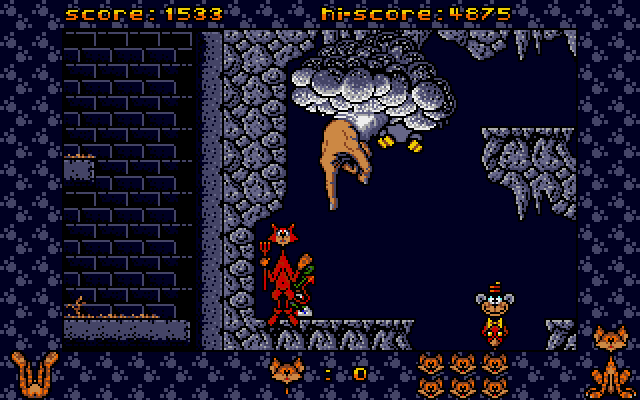 I've always been fascinated with Astral's haunted house platformer which I feel has a charming and great comical character. No haunting would be the same without lots of frightful creatures and this game has everything from witches, zombies, werewolves, vampires, ghosts and even the odd weird statue that sticks out its tongue at you! Each level has a particular task described during a mini-intro but the objective is to hunt down and collect all the skulls and lay their souls to rest. 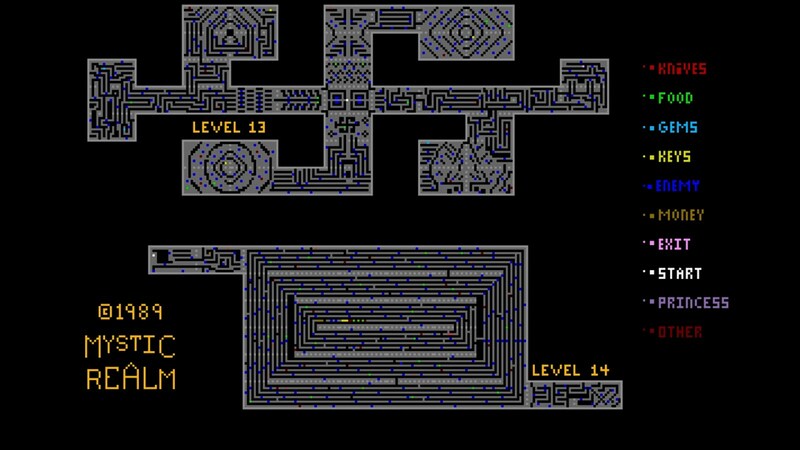 However, this is one tricky play through a maze of creepy screens which often contain puzzles. This is no arcade-style platformer, more of a Fire And Brimstone so keep your composure wear your patience head, Worzel. The visual style is perfectly apt for the 1950's cinematic theme with smooth scrolling, incredible artwork and freaky characters who are also superbly animated. Just wait until you die and see yourself shudder before violently suffering a Scanners-like headache, no matter the actual cause of death! I must say that I am impressed with the palette used, each level is its own mini-movie and looks absolutely tremendous. The horror is typically cheesy so if you think this is going to be scary, then you're in for a different kind of shock. Audio is nothing short of incredible with a chippy rendition of Montagues and Capulets which couldn't have been a more perfect choice. I'm sure I'll be humming this all day long! All sound effects are high-quality samples with the wolf howls being my favourite. However, I'm disappointed there is nothing for my head-exploding deaths? This is one of those games that eats away the hours but also requires practice and plenty of patience because the gameplay mechanics are cruel. 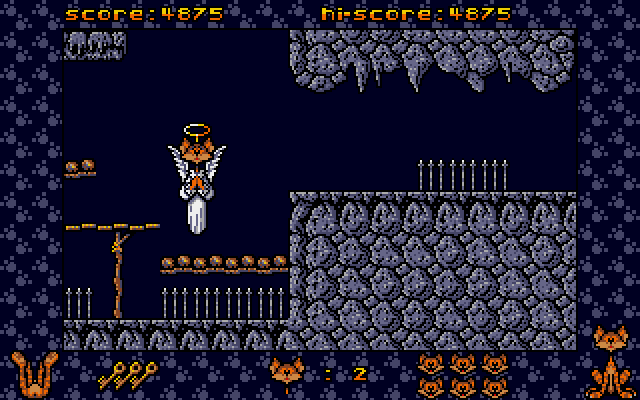 In fact, it's often infuriating on later levels, just try Family Chapel if you don't believe me... 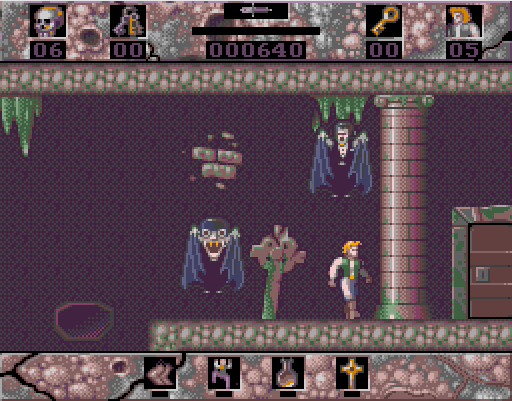 Horror Zombies From The [Atari]Crypt is the perfect title for such a cheesy platformer. I wish it was a little easier but killing wolfmen, zombies and running scared from piercing vampire glares is right up my street. Gory fun! 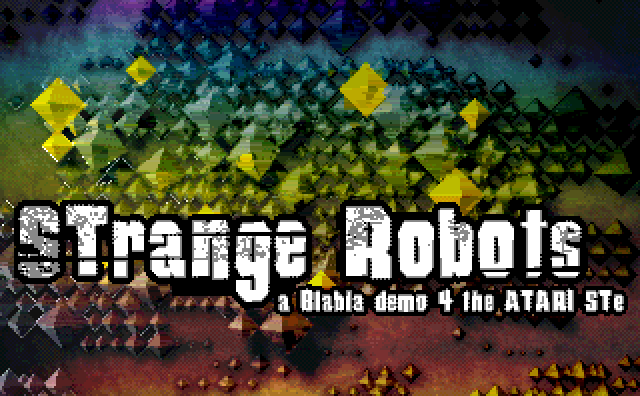 - A hard drive installable version is by D-Bug with floppy disks available via Old Games Finder. - Level passwords: Wolfman, Hammer, Lugosi, Nosferatu and Garlic. Today I fancied a quick blast of one of my favourite ZX Spectrum games - RIVER RAID!! 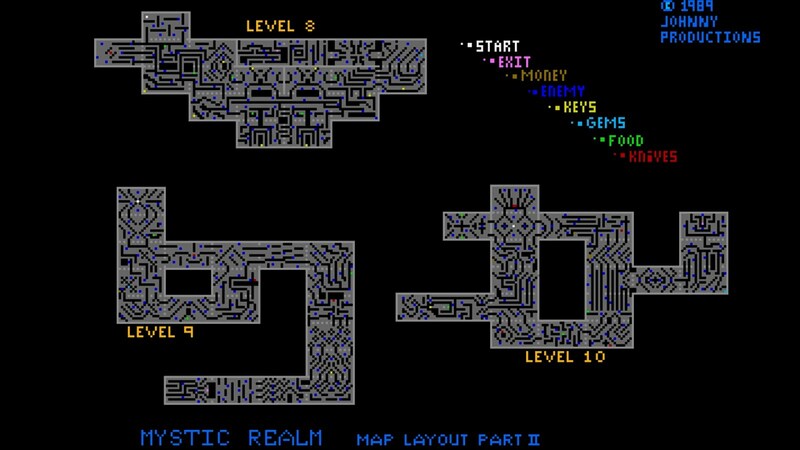 Okay, I know it's kinda lame compared to the Atari 2600 original but I have many happy memories playing this with my schoolmates. 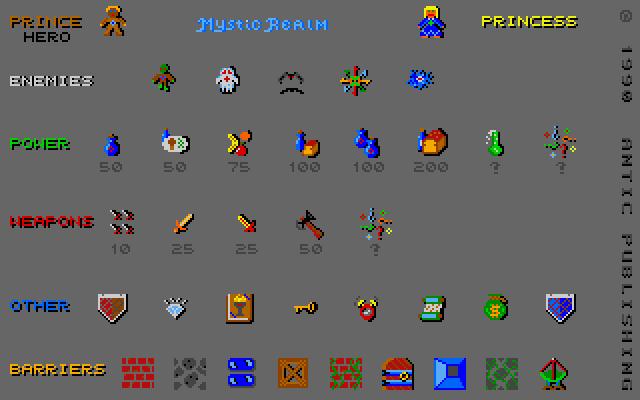 So I figured I should put some of that Mega STe power to good use and (because there was sadly never an official ST conversion) boot up the Speccy emulator for some colour-clash action. YEAH! !